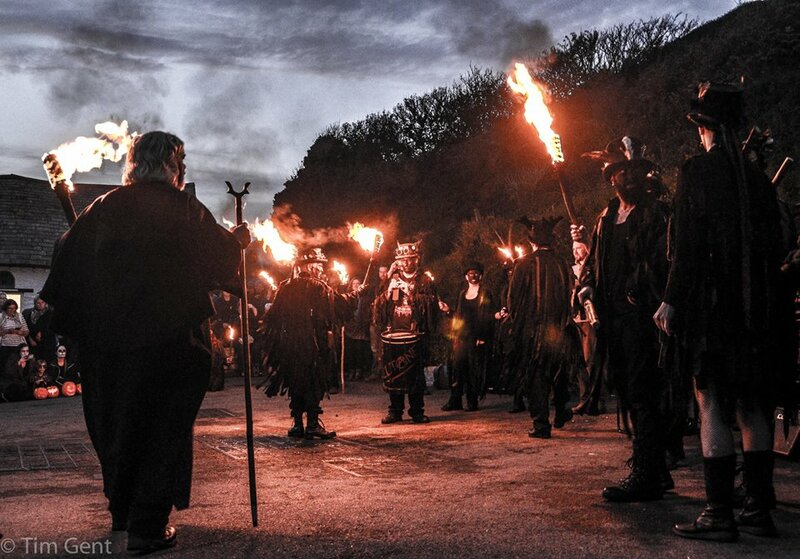 It’s that time of year again when folks of pagan persuasion start to bang on about the Worlds Seen and Unseen and inform us that ‘the Veil is thin’ at this time of year. 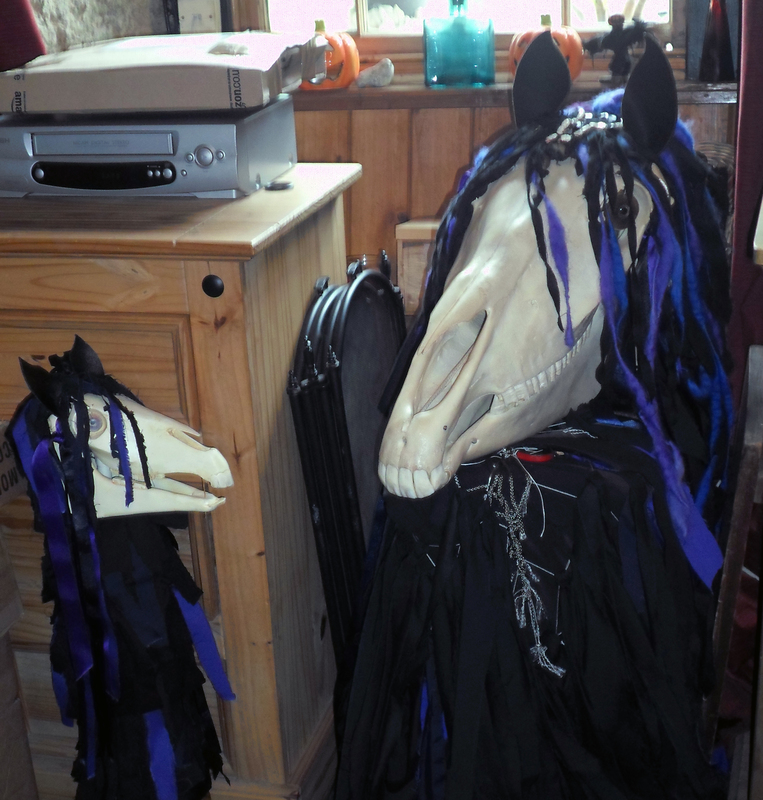 Well, I don’t feel that ‘the Veil’ is particularly threadbare at this time – unless of course you think that as there are a lot of Festivals of the Dead around now that somehow this is causing the Veil to be eroded in someway. I think the Veil is made of much sterner stuff than that! Remembering the Ancestors can be done at any time and in my opinion there needs to be more acknowledgement of them all year round. Otherwise we end up just paying ritual lip-service to the Old Ones. It’s a bit like honouring the veterans on Remembrance Day and then ignoring them for the rest of the year – see my post on this: Will We Remember Them? Now let’s look at the Worlds Seen and Unseen. Usually this term is blithely trotted out by many but what does it actually mean, apart from sounding slightly spooky and darkly romantic? Well bad luck if you thought otherwise, but I’m not going to deliver some sort of esoteric and erudite lecture on this subject. There are plenty of books and articles out there, beautifully presented in quaint archaic language for you to indulge yourselves in… at a price I may add. My thoughts will be presented in the way I know best – pragmatically! There is a familiar saying which goes, “Seeing is believing”. Well, do you believe that is the case? There are all sorts of things that go on right in front of us and yet we don’t see them. It’s called being ‘In Plain Sight’. As humans we rely pretty heavily on the visual to inform us about our environment, to the detriment a lot of the time of our other senses. This over-reliance on the visual can however leave us pretty vulnerable, especially to those who take advantage of this trait and use illusion, allusion, subliminal messages and glamour to achieve their ends – and it doesn’t stop there. The mind can play tricks too. We’ve all heard of brainwashing and indoctrination and many fundamentalist religions and cults utilise this with horrifying effectiveness. However, we can also do this to ourselves unwittingly if we form prejudices against anything/anyone that reminds us of what/who has harmed us in the past. When we experience trauma in anyway it’s very difficult but oh so necessary to keep things in perspective. Not everything/person who triggers that response is going to be equally distrustful but it’s hard not to think that at the time it’s happening. Alas however if we do not, then we start to develop a kind of knee-jerk tunnel vision about the whole situation. If you look for something hard enough then you will start to see it manifesting itself in front of your very eyes. In a sense you have invoked it and if you have a strong magical mind it will be even easier to perform this illusion – for that is what it is. It’s a kind of thought form – and that’s where the danger lies – when we assume things, and then act on those assumptions and reach what we see as the inevitable conclusion. We are believing what we are seeing. It’s all a bit of a minefield isn’t it? So how do we avoid these kind of pitfalls? It’s said in the occult world, ‘Test the spirits to see if they are real’. I’d say have your powers of observation fully turned on. When I was young in my craft I was taught how to fine tune my focus by concentrating fully on a candle flame. I was then taught how to gradually extend that focus to include the sides and then my peripheral vision. Eventually after considerable practice I was able to extend this focus to include behind me as well but that took a long time. The point being was to be fully aware of what was going on all around me. In the same way we need to have full information of any given situation and to sift that information with an unbiased, flexible mind. Evidence is of no value if it is assessed by a mind that is programmed to see things in a fixed, pre-determined way. What I’m referring to here is the magical Will – the ability to let go yet be fully aware. If you don’t have your Will in a healthy state then the effectiveness of your magic, not to mention your day-to-day life, will be adversely affected. There are other more prosaic methods that stand in good stead to develop good powers of observation and at the same time, a fine appreciation of those around us. Notice what people do. We often use the metaphor of the swan apparently effortlessly and gracefully gliding across the surface of the water, whilst underneath the flippers are exerting a lot of energy to maintain that. This sums up neatly what often happens for a lot of people. They work quietly in the background getting necessary organisational and logistical tasks completed whilst the person or project that is more visible gets the majority of attention and praise. Even though every now and then these folk are mentioned in dispatches and referred to as unsung heroes, these backroom boys are usually consigned to an afterthought. Take time to acknowledge and thank people for their input and hard work. Show appreciation to the tea ladies, cleaners, and shop assistants. Take a moment to pass the time of day with someone who generally doesn’t get that sort of attention – you’d be surprised at the difference it can make. So, rather than just fixating on what is seen and blanking out the rest, remember the unseen that is actually right there in front of you – if you only had eyes to see it. So on to the evening of the All Hallows Gathering. First of all we descended as a ravening hoard to the Cobweb Inn for some much-needed victuals and of course, beer! 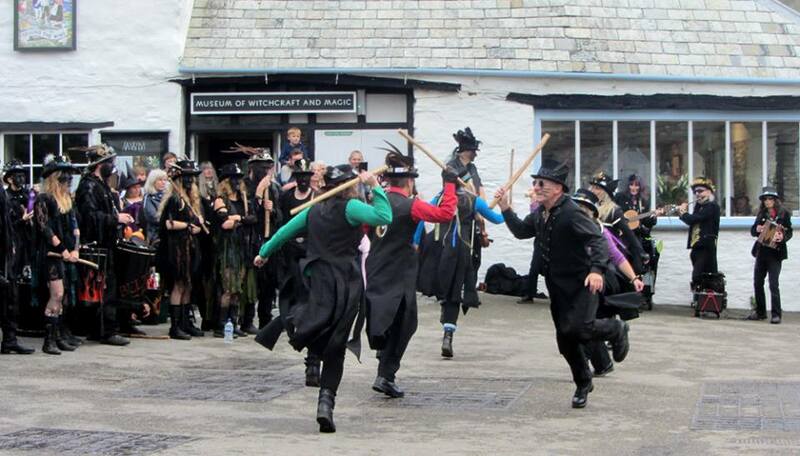 As is traditional at these Morris beanfeasts, someone started up a rousing and appropriate tune which we all merrily joined in with. Once we were all adequately fed and watered, it was time to bring out the Osses and start our visitation of the pubs with our final resting place being the Wellington Hotel. 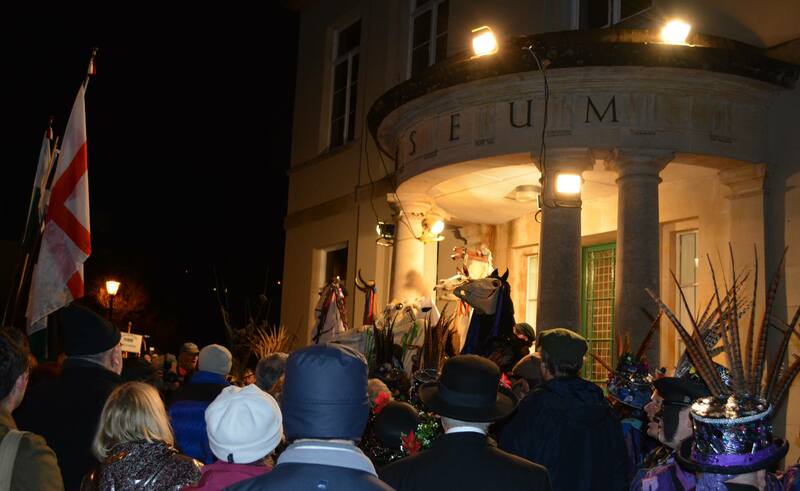 I had set up an evening’s entertainment of song, dance, music and storytelling – however, it soon became apparent that we had underestimated the sheer volume of people who descended on the pub. The poor bar stuff were doing their best but they didn’t have a moment’s peace until many hours later. Without a PA system it was useless even trying to tell a story, so a note for next year should we be in the same venue – book PA early! There also wasn’t the physical room for everyone to sit down let alone brandish musical instruments as people were sitting on the floor and stairs – so music and dancing was out. So that left belting out some rousing songs, which is what happened for the rest of the evening. My apologies to anyone who came along hoping to see a well-ordered evening’s entertainment although Steve Podger was gallant in his continuing role as MC making sure that everyone that wanted to perform got their turn. The high point of the evening for me was when Will Fox got up to sing Tam Lin. This is a magical ballad of extraordinary potency. Although it is specific to Scotland the motif of transformation by the Fair Folk is repeated in many cultures worldwide. Traditionally, and certainly I have observed this myself, it is very difficult to sing and only certain folk can manage it without recourse to reading the words or stumbling/forgetting the lyrics. Will Fox managed it superbly. It was pure magic, I was very impressed and told him so the next day! I had intended to include an excerpt here as the whole song, although recorded at the time, will take some time to upload to YouTube. However, it’s not ready yet so in the meantime enjoy this photo of the young man concerned and Watch This Space….! The evening eventually ended with the organising team having a quiet drink at the other end of the bar and reviewing the day’s events. We were all a bit staggered at how well it all went, how relaxed the atmosphere and how much so many people enjoyed it. We then said our farewells and departed for our various hotels and B & Bs. The next day was spent getting feedback from the local businesses who were without exception delighted with the way that trade picked up at what was usually a very quiet time of year. 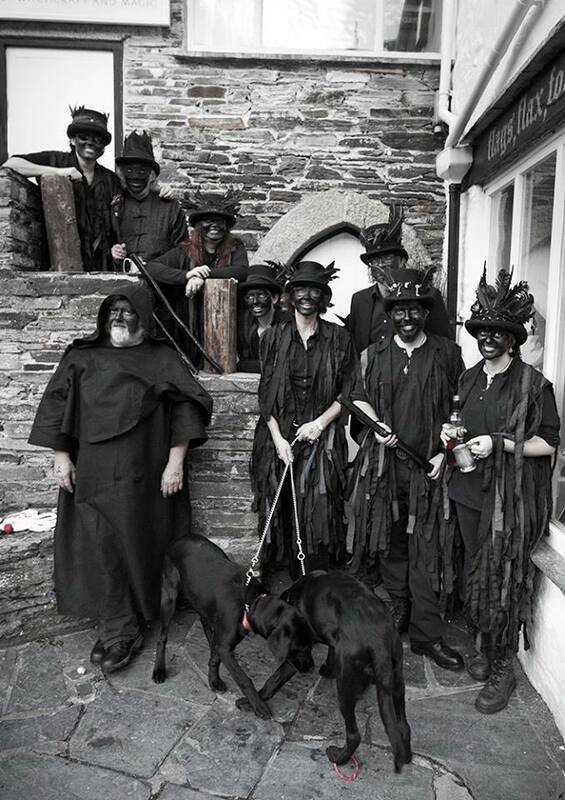 So, the Gathering was excellent news for the local economy and the Chairman of Boscastle Chamber of Commerce was very pleased indeed and is looking forward to us coming again next year. 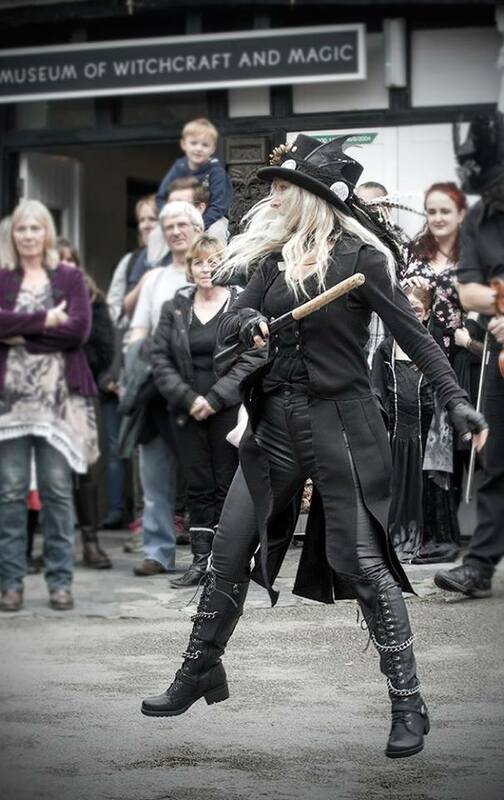 This has also been confirmed by the Museum of Witchcraft and we have decided that it would be best for all concerned that in future the date for the All Hallows Gathering will be the Saturday nearest to Halloween. This means that next time we shall be doing it all over again on Saturday 29th October 2016. There will be a few new additions as well so lots to look forward to…! 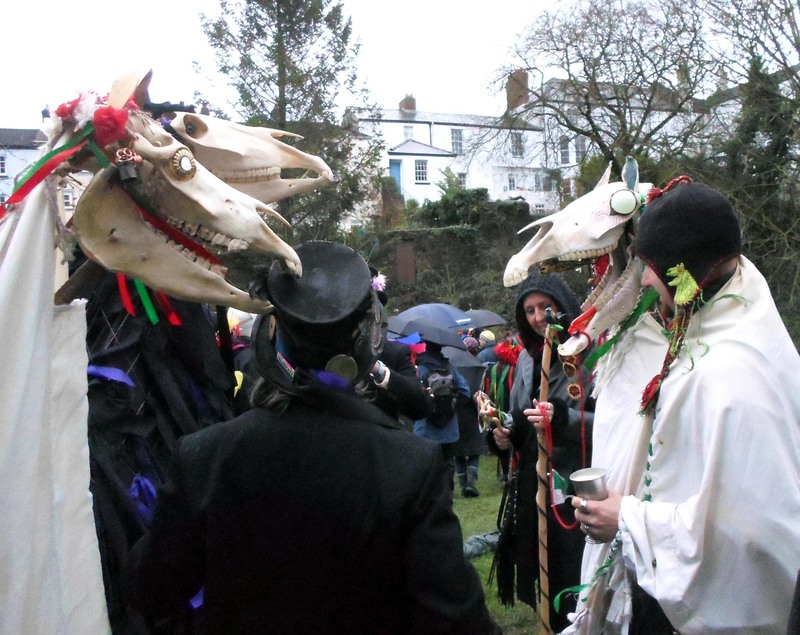 At this juncture I would like to give a particular vote of thanks to my fellow conspirators who helped so much to get the All Hallows Gathering off the ground. Thanks for staying with it guys and for giving so much help and support all the way from Wales. So at last I have reached the end of this particular blog and believe me I am relieved to do that! It has been very intense but oh so powerful an experience! 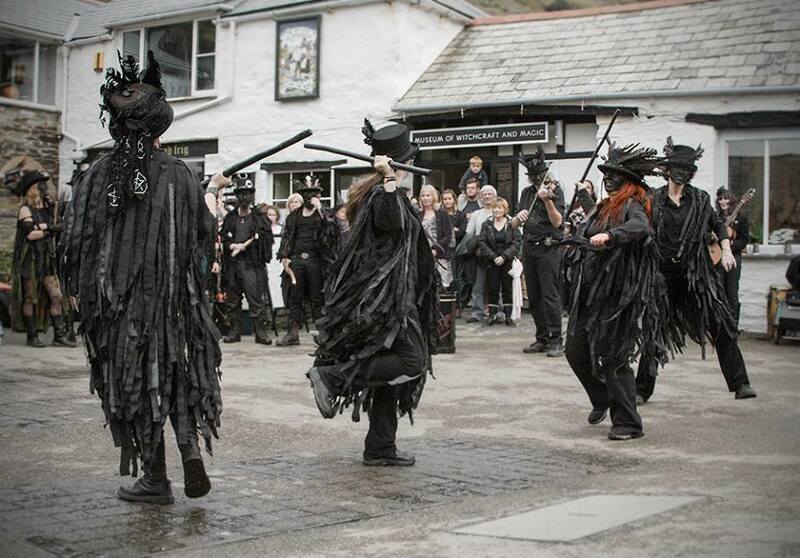 Before we left Boscastle last weekend we were hearing that some people as they were booking out of their accommodation, they were already booking up for next year’s event! Thank you one and all who came and shared such a magical experience with us. See you all next year – and remember it’s on Saturday 29th October. 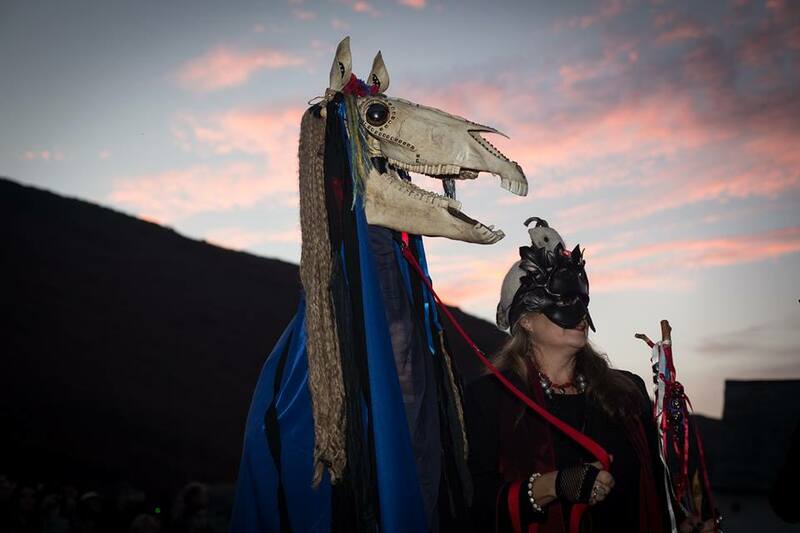 What a spectacular event the All Hallows Gathering turned out to be! 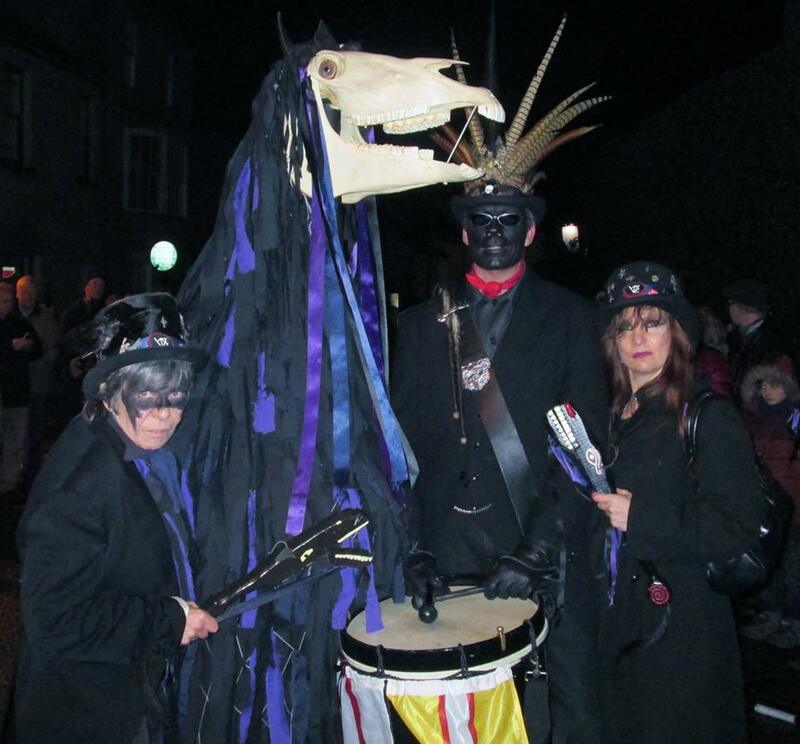 As one of the main organisers I was experiencing considerable nerves and trepidation as Halloween approached this year – I had never attempted anything of this size before which involved quite so many people and logistics. My main concern was the weather but as it turned out the weather gods were kindly and it was a beautiful winter’s day and evening. Another issue that was on my mind was what the attendance would be like – performers as well as audience numbers. I needn’t have worried as I watched what eventually turned out to be hundreds people slowly arriving and setting up. 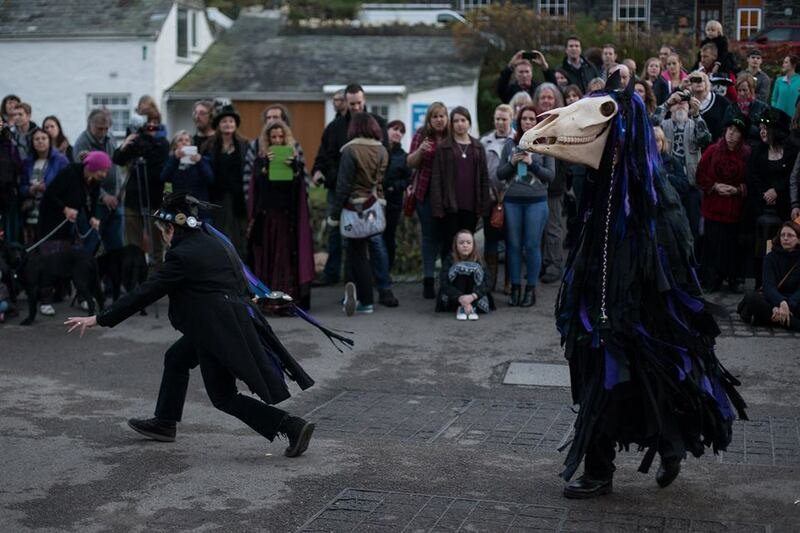 The air was electric with expectation and anticipation and it was heartwarming to see so many people gathering together to celebrate All Hallows in such a special way. 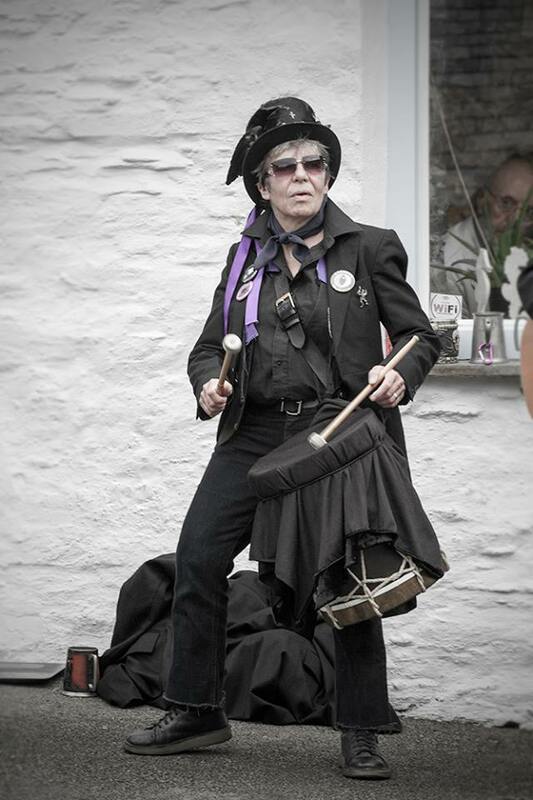 Events kicked off at 2 pm with Catseye Morris, based in Cornwall – the side that I belong to as a member of the band, and Laetitia as a dancer. Next up was Shadow Hunters all the way from Worcestershire. This is a group that was especially created for this event. 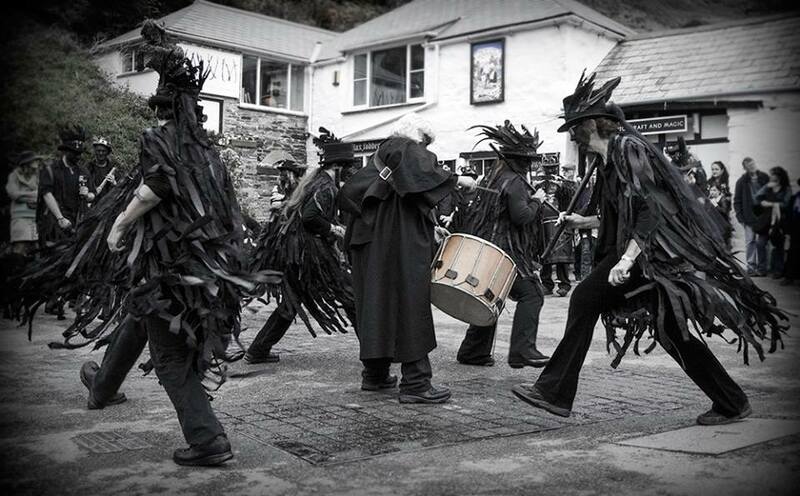 It started off as a ‘Dark Morris’ scratch side and evolved to become an official Border Morris side. 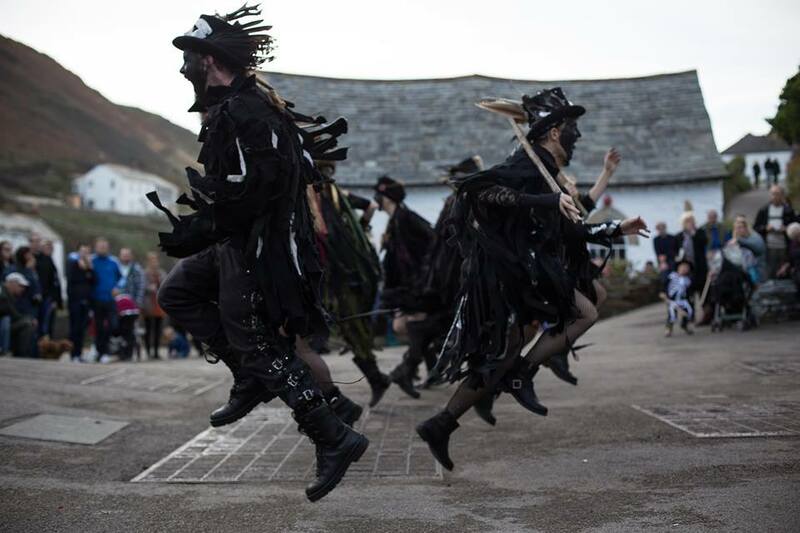 They were energetic, elegant and spooky – not easy to achieve! 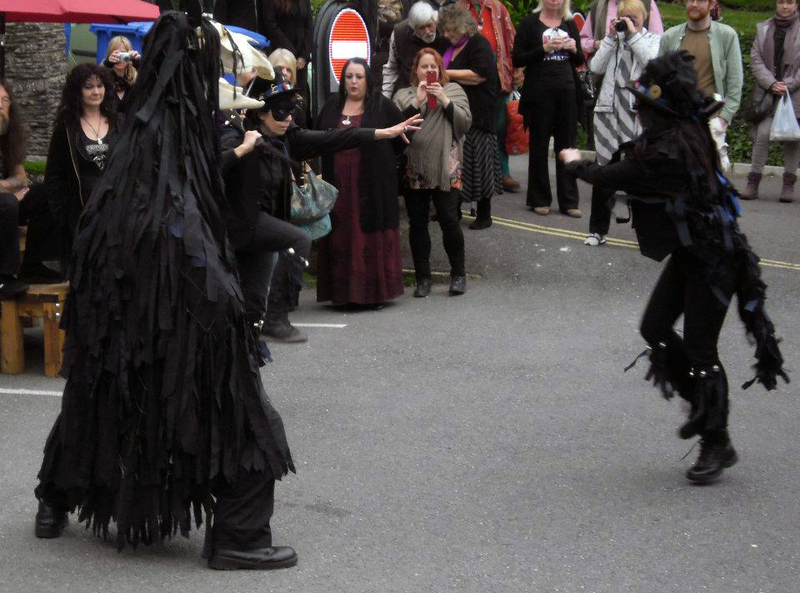 Then came the infamous Beltane Border Morris from Devon. They are renowned for their theatrical and punchy performances and we were delighted that they decided to join us at the Gathering. Then it was time to go and get Penkevyll from her stable where she was impatiently pawing the ground, so to speak. 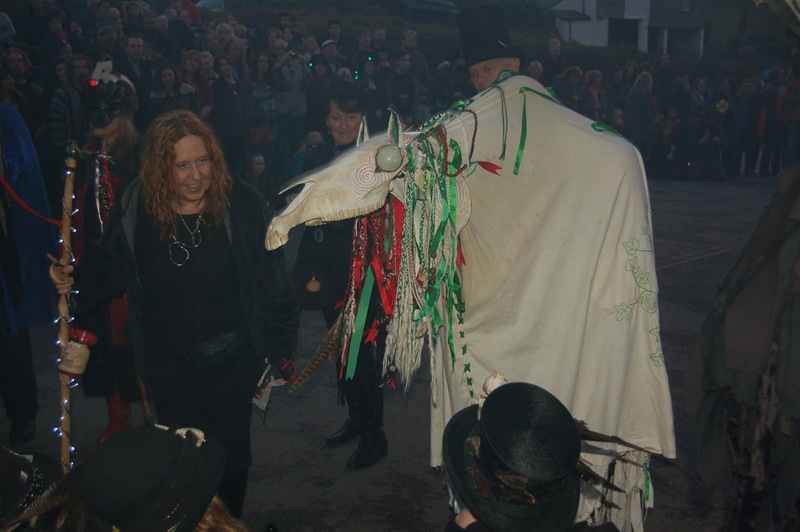 The crowds delighted in her antics and then as the tribal drums began, witnessed Penkevyll and her Teazer (yours truly) start the dance which called up the Mari Lwyd(s). 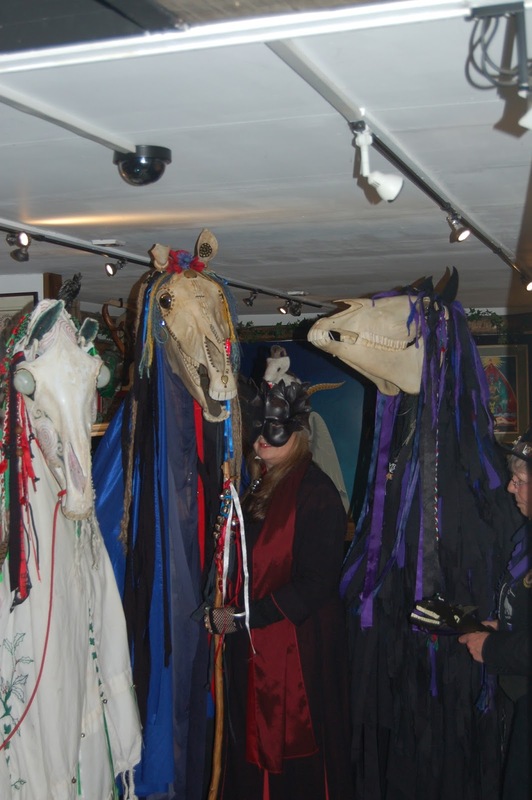 Once the Mari Lwyds had gained entrance to the Museum there followed introductions. Penkevyll and Y Fari Troellog were old friends, but Penkevyll and Mari Celeste had not met and exchanged pleasantries as only Obby Osses and the like can! We then set off around the Museum bestowing blessings as we went. 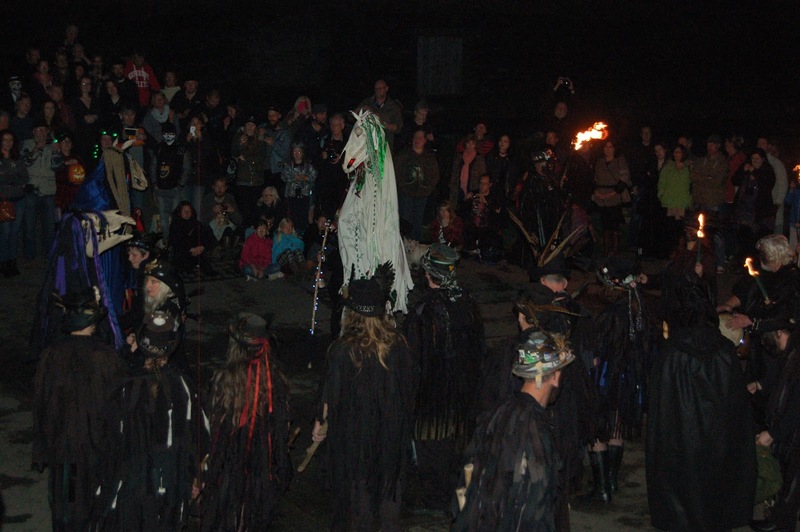 Meantime outside Steve Podger, my very able Master of Ceremonies, with the fantastic support of Beltane Border Morris entertained the crowd by torchlight with some powerfully evocative and wild dancing. 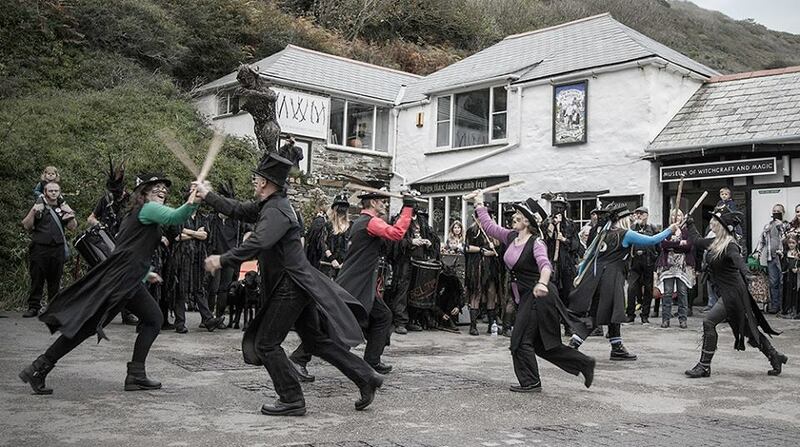 This included the now famous Beltane Fire Dance! Once they were fed and watered, the Osses emerged from the Museum and mingled with the large crowd and danced to the pulsating tribal beat of the drums until it was time to end this part of the evening. Steve our trusty MC, wound up the day’s proceedings and we wended our weary but elated way into the night for a well-earned dinner at the Cobweb Inn! 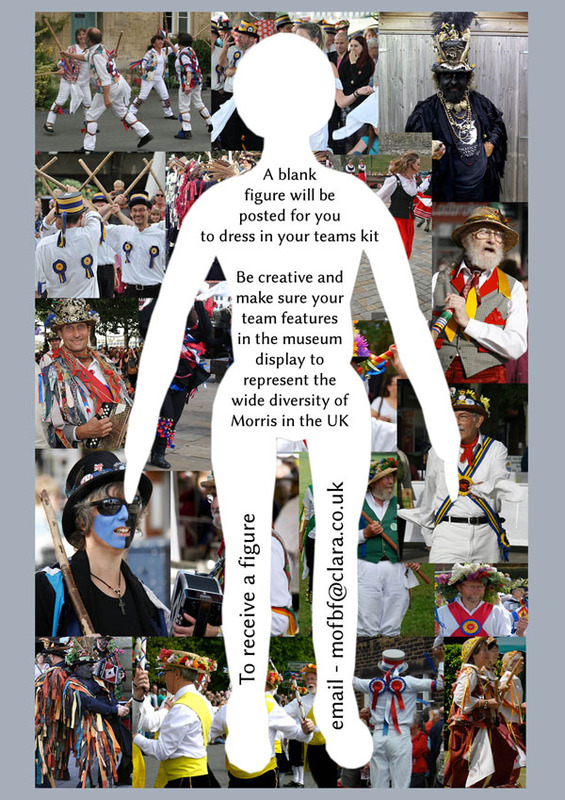 I have belonged to a Morris side for about five years now, so had a special interest in creating a doll that would be part of a display in a museum. 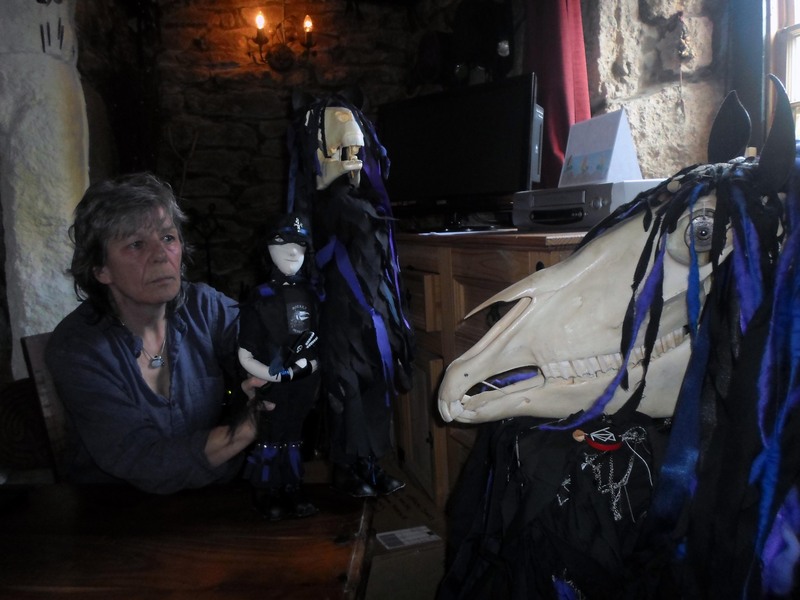 The side I’m with is called Boekka (Cornish for Scarecrow) and I’m a founder member. 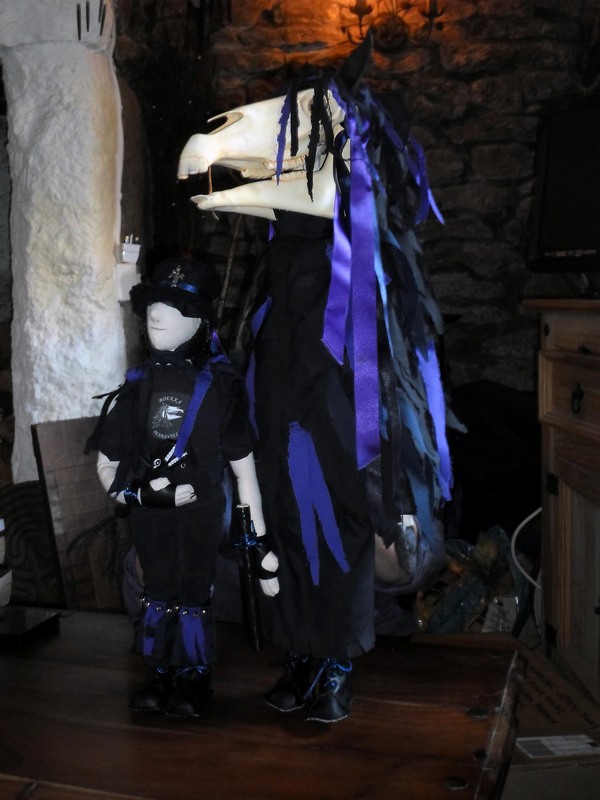 Myself and Laetitia along with her son Rhys first formed this group following the departure of our Obby Oss, who used to be a Penglaz, from the Golowan Festival. 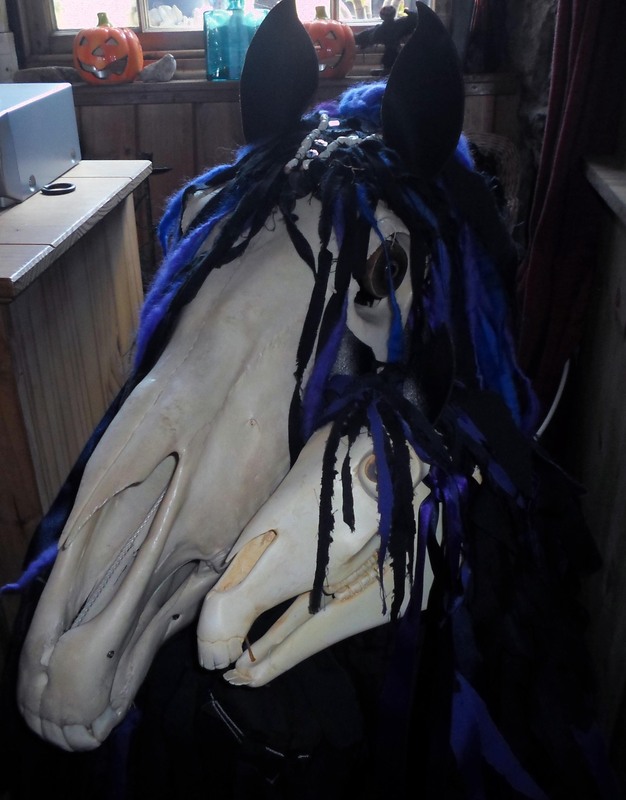 We changed her appearance, her name and title – she then transformed into Penkevyll the Lands End Obby Oss appearing alongside Boekka. Following many months of pestering the beleagured Simon (a notoriously busy man!) eventually a large package arrived at our cottage containing not one, but two dolls. 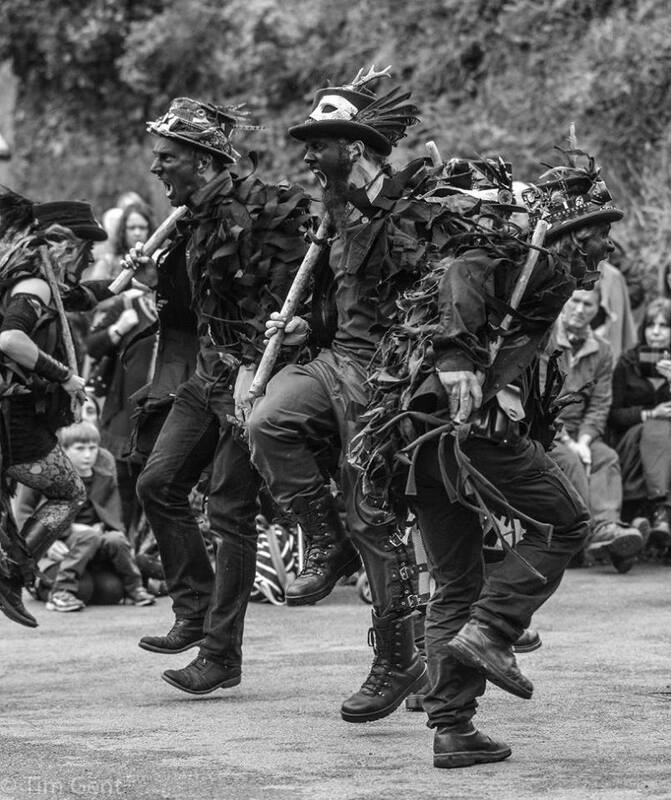 This lead us to believe that maybe they wanted us to create not just a doll representing our side’s Morris dancer, but also our famous (or should that be infamous?) Obby Oss as well! 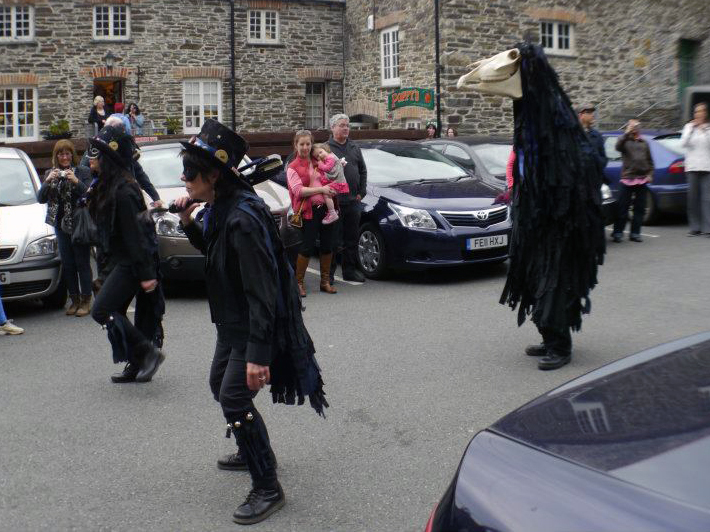 Simon had seen our Oss, Penkevyll in 2012 at Charms Day in Boscastle when Boekka gave a performance to wind the day’s events up. 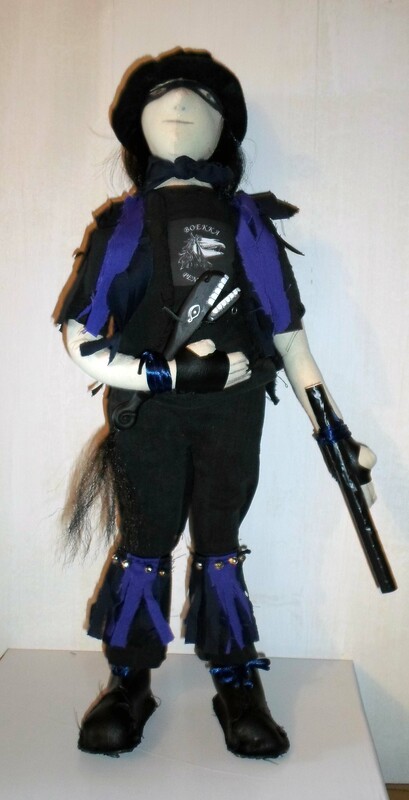 So it was time to start making the dolls. First job was to assign who was going to do what – always a tricky one! 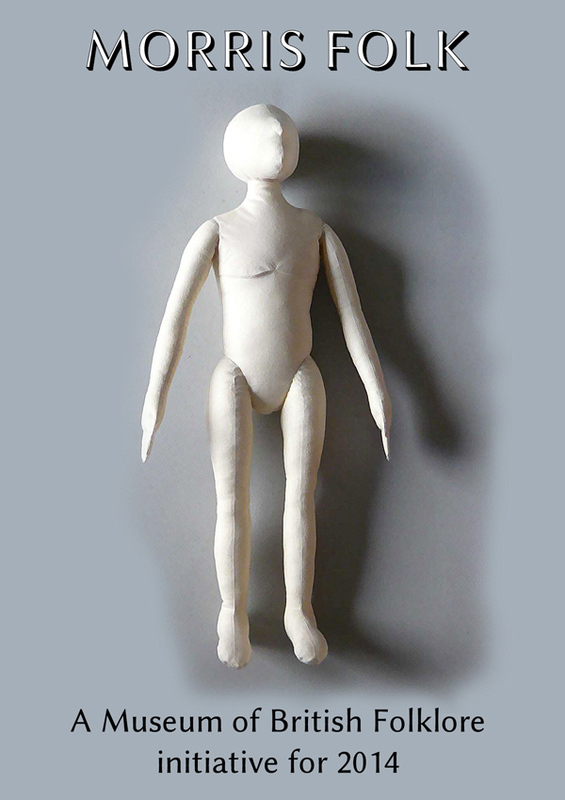 We started on the Teazer doll first. Laetitia drew the short straw and was lumbered with all of the sewing. She has small hands and produced neat work creating the T shirt, tailcoat tatters, trousers and boots. (This is what comes from being really good at something, you become the victim of your own success – a lesson I have found out many times to my cost!) Whereas, I have large hands for my size and am very clumsy with tiny, meticulous work. I sourced materials, created and cut out templates and was a general ‘gofer’ (go for this, go for that etc). I asked a good friend of mine, Chris White for advice on how to make this as he is into model making; and before I knew it he had kindly offered to help us out by creating it himself – and what he created was superb! I’ve been asked to write about how I did the construction of what all involved came to call ‘Little Penk’. I’d just like to stress a couple of things. I’m disabled and this took months rather than days. Secondly I’ve never done anything like this before. 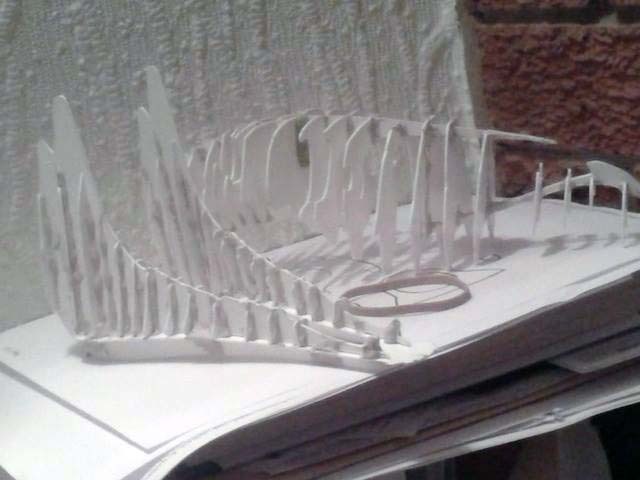 Although my background is in art and design I have no skill in symmetrical sculpture and had to work out just how to do this from scratch. What I came up with was a combination of hybrid techniques that would give me a guide to work to as it progressed. 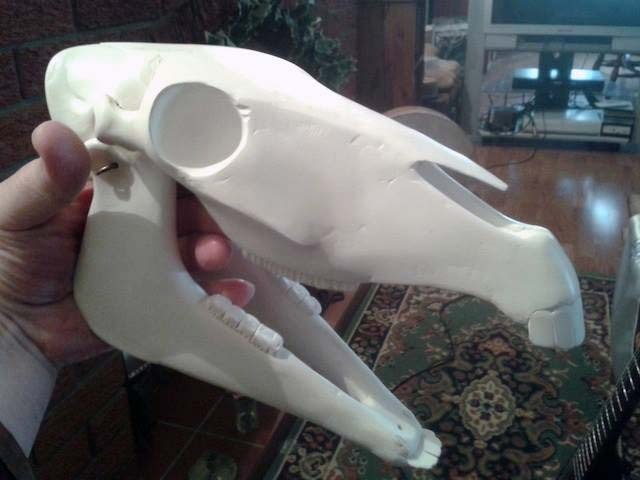 Living halfway up the country I didn’t have direct access to Penkevyll so I bought a digital model of a horse’s skull. I was lucky that one was available! I brought this into Cinema 4D, a program I’ve used in the past for digital modelling. It was used for the dragons in the Harry Potter films so it’s a really versatile program. 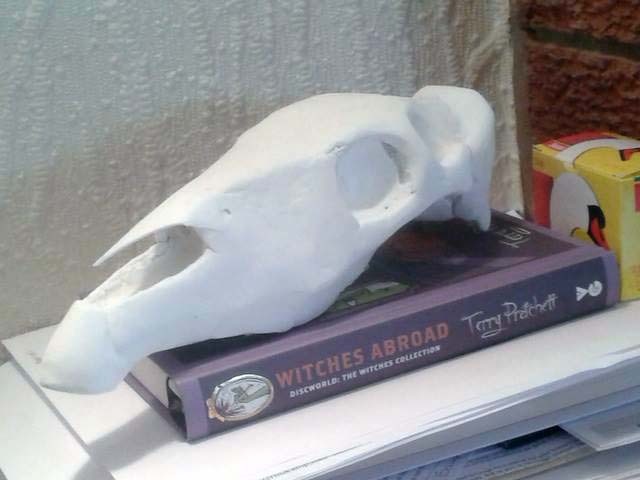 I scaled the skull to size using photographs of Penk’s skull next to her ‘Rider’ so the small one would be the appropriate size next to the Teazer doll. 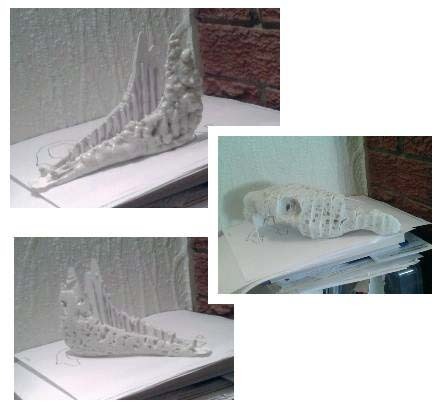 The important first stage was to build the basic skull from a series of cross sections taken from the digital model, printed out of the computer then cut from a material called ‘Plasticard’. I found out about this from a friend who does a lot of model railway modelling. I hadn’t a clue what materials I’d need so this was the first step of many like this. All the cross sections had to be kept in careful order obviously until I could put them together. I used three different kinds of adhesives until I found one that did what I wanted too! So now we have a rather fragile basic construct that gives us and accurate 3D reference to work on to. That’s the hardest part over. Very scary and very slow, that bit. 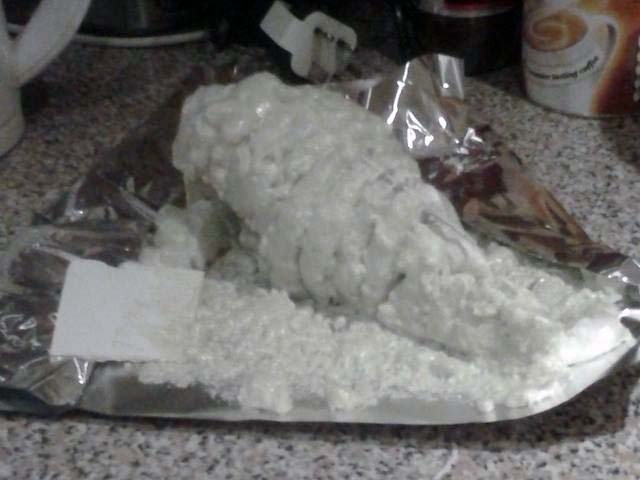 Next I used expanding insulation filling. This comes in an aerosol can and is a pig to use! It’s sticky and sloppy and risks distorting the flexible cross sections as it expands between them so I had to scrape some of this gloop out as it started to dry. It expands so much it pretty much buries the form. However, weight is a major problem with man-animals of any scale and insulation foam gives you form with minimum weight. The adhesive property of the stuff bonds the Plasticard sections together very nicely. Disgusting isn’t it? So now I could cut and sand the foam away back down to the surface of the cross sections without distorting the base of the shape. Now I had an accurate, symmetrical 3D shape. Although I had a stable form it was still quite fragile so I had to coat it with something to give it strength. I opted for something like polyfiller. This was quite heavy at first but, being water based, it dried much lighter. I skinned this one and sanded it back as much as I could to retain the outline of the underlying form. I’d been looking forward to this part. I love the delicate, architectural form of skulls, especially rodent and bird skulls. The orbits of the eye sockets are particularly lovely and as the form refined I spent a lot of time just enjoying running my hands over the emerging shape. The more I did though, the more there seemed to be that needed doing! It’s just as well I didn’t have a deadline for this. The fine point at the top of the nose was another piece of Plasticard which I embedded. This brings me to the final ‘skin’. It had to be strong and light while being smooth, being able to take detail well and giving a good surface for paint. I found the perfect material. Called ‘Miliput’, it’s a two-part epoxy putty. Once I got it stretched onto the surface, working it carefully across the form, flattening and smoothing, I found that working with wet fingers makes it very smooth, taking out any finger marks and smoothing out irregularities in thickness beautifully! Once cured, it’s very hard; sands well and takes detail very well. The teeth posed a bit of a problem. I opted for Plasticard again. To bend the teeth around the curve of the skull I heated the ‘denture’ in very hot water. Fortunately Plasticard is a thermoplastic so once heated and shaped, it will cool to that new shape and can be glued in position without it trying to flex back again. To my delight the jaw fitted perfectly! All that slavish measuring and cutting at the beginning had paid off. Just as well, because to correct something like that in three dimensions would have been a nightmare. 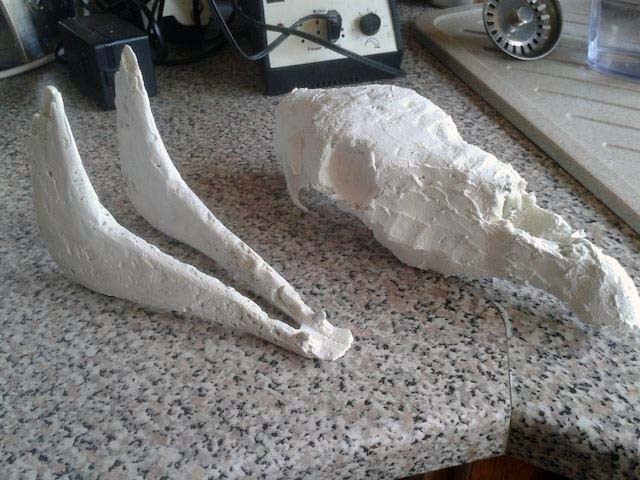 I drilled and hinged the jaw using a piece of coat hanger wire. All the usual bits and bobs that Animal keepers end up resorting to! When it came to the eyes I decided to print directly from the photos of Penkevyll. Cassandra and Laetitia took such good pictures that I was able, correcting for distortion, to copy and scale the eyes straight from those. They were glued onto disks of Miliput and varnished to keep them bright and lively. Since my fine art days I’ve always preferred alkyd paints. They have the depth and transparency of oils but dry much, much faster. They’ll go onto practically any surface and can be layered and glazed for depth and subtlety. Perfect for bone, then, as it’s such a tricky colour and changeable under different lights. Alkyd can take care of all that. Finally the ears. I carefully copied the profile (thanks again to lots of rapid feedback from Cassandra!) for the ears and cut them from black leather. Then came the support for the head. Tricky. Traditionally I’d always kept the internal bits of my Animal in my Green Oak days, strictly schtum. So it goes a bit against the grain. Nevertheless, this is essentially an archive piece so on we go. 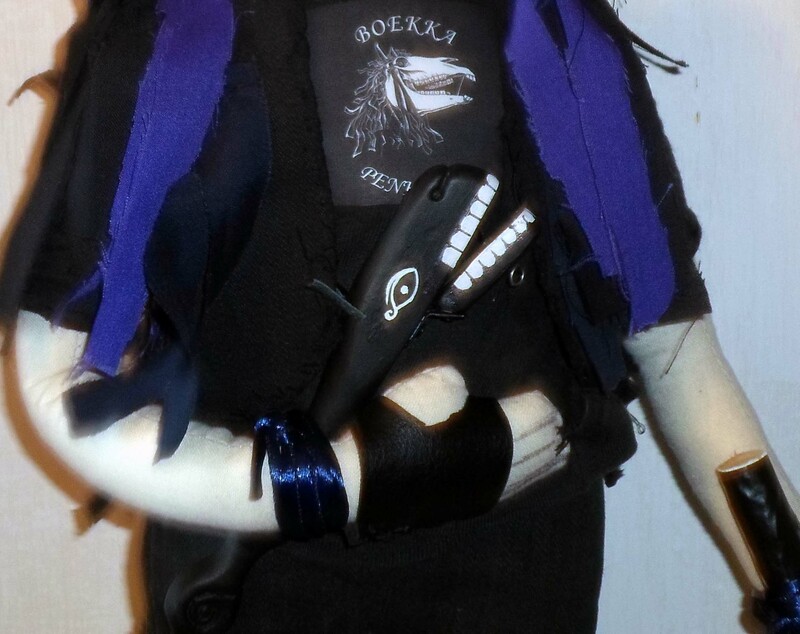 Although Penkevyll has a harness support, the doll would not be able to support this Animal so I had to think of an alternative. Pole mounted heads are traditional so I went with that option as it could be set to take the weight off the doll. I nobly sacrificed one of my metal walking poles. Let me tell you, aircraft aluminium is a pain to saw!! 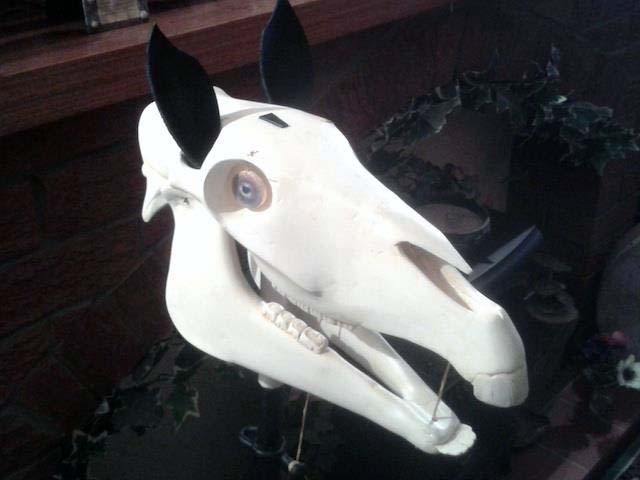 Ears, jaw strung and working and staff mounted. Ready for the off! It’s been a long project but very enjoyable. I was able to test some ideas and see how much I’d retained of my skills. Truth to tell it was hard on the hands (as I’d suspected) and when I occasionally overdid it I had to take a few days off. But in the end I got a result that I was very happy with. Next she was shipped to Cornwall to be properly dressed and coiffed by Latham-Jones Haute Couture. And a magnificent job they did too! See Cassandra’s pictures. Photos in a moment. Once we’d got over oohing and ahhing over Chris’s remarkable work we set to finishing off the dolls. Together we managed to lash the doll to its accompanying pole, secured the ears and the mane that I had painstakingly woven loads of tatters into, and then Laetitia sewed on her gown which was lovingly covered in tatters. This is when we realised that Little Penk was looking far too neat, so I set to with a pair of scissors and made her tatters more ragged and more in keeping with the ethos of Boekka. Here are the final photos of all the dolls and Penkevyll together. To directly quote Simon, ” Thank you so much for coming over with your wonderful creations! 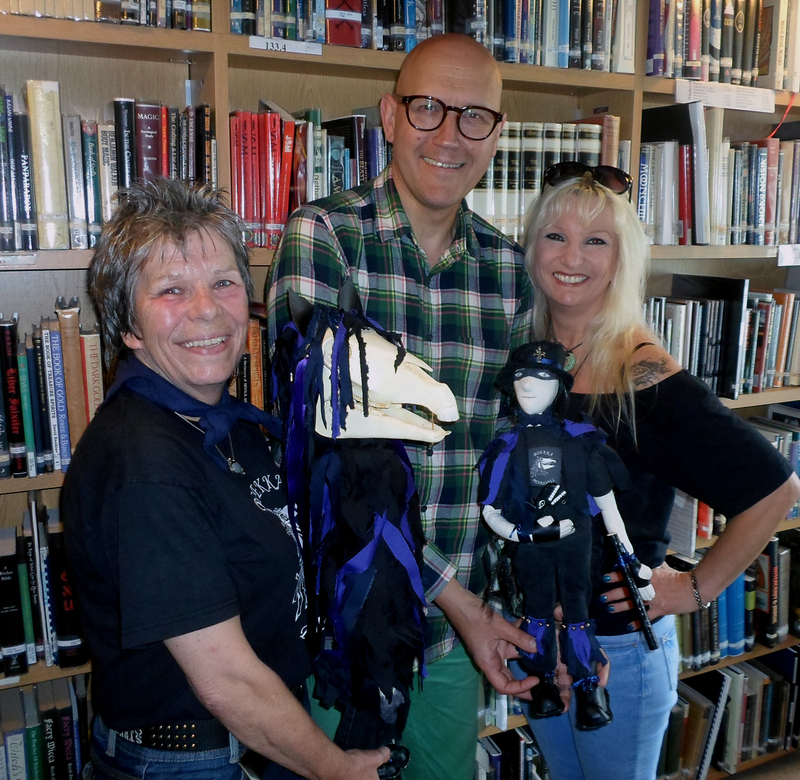 They really are spectacular.” It was well worth all the hard work and we look forward to seeing the dolls displayed within the next exhibition of the Museum of British Folklore. It’s good to know that you are producing something that will be preserved for prosperity and displayed within a museum environment. Penkevyll makes it as a Cover Girl! Yes, Penkevyll the famous Lands End Obby Oss, has made it as Cover Girl to the glossies! 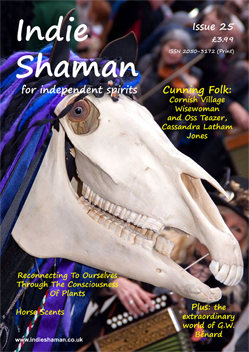 “Out soon – Indie Shaman ‪#‎shamanism‬ magazine Issue 25. A great time to subscribe – get Issue 24 on subscription and Issue 25 at the end of July at https://indieshaman.co.uk/. Book reviews including Itzhak Beery’s ‘The Gift of Shamanism’ and ‘The Toltec Secret’ by Sergio Magaña Ocelocoyotl plus Shamanic Events calendar. Our arrival was not wonderfully auspicious as the sat nav directed us over the Severn bridge, which incurs an expensive toll, round the roundabout and then back over the bridge to our accommodation for the night! 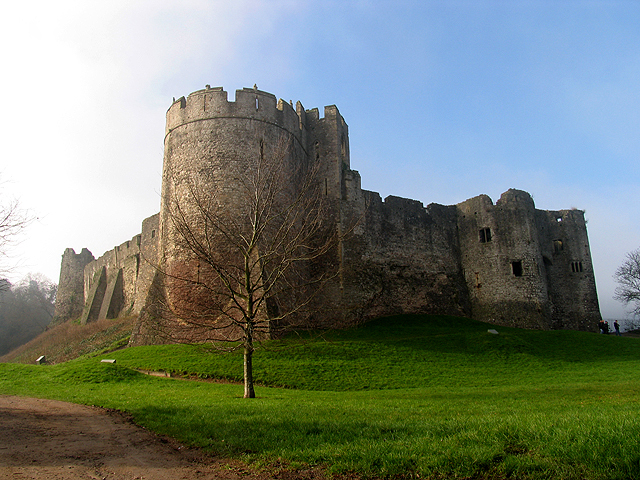 Once we’d changed into our kit and piled into the car again it was back over the bridge – another expensive toll, and then on to the car park at Chepstow Castle. 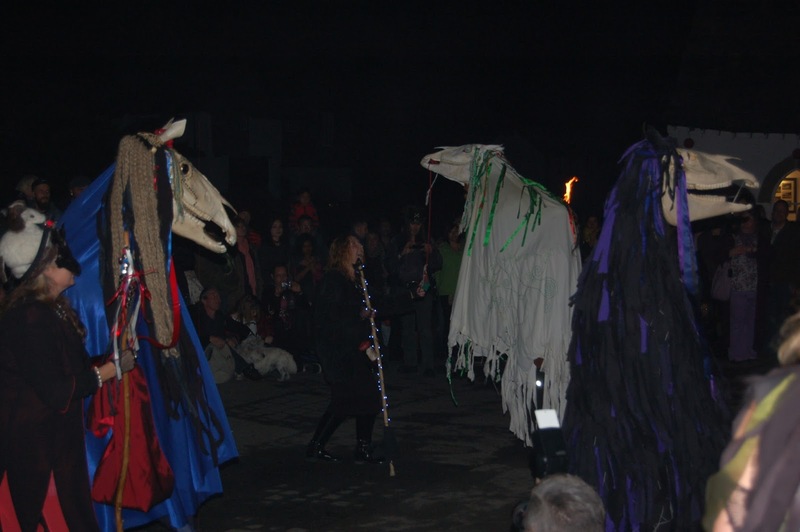 We quickly assembled our Oss and Penkevyll came alive – we were ready to meet the Mari Lwyd! 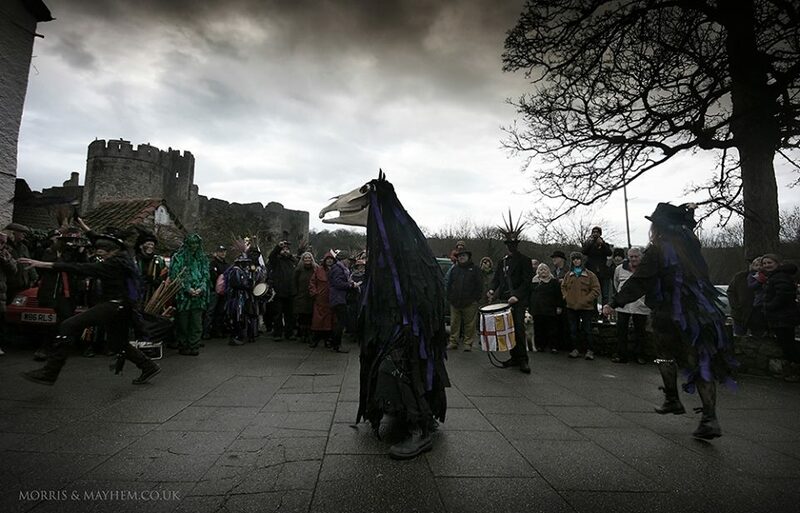 We made our way toward a large crowd of revellers that had gathered together underneath the walls of Chepstow Castle. What an awesome castle it is too! It’s Norman, dating back to 1067 and you could literally feel its history emanating from within it. 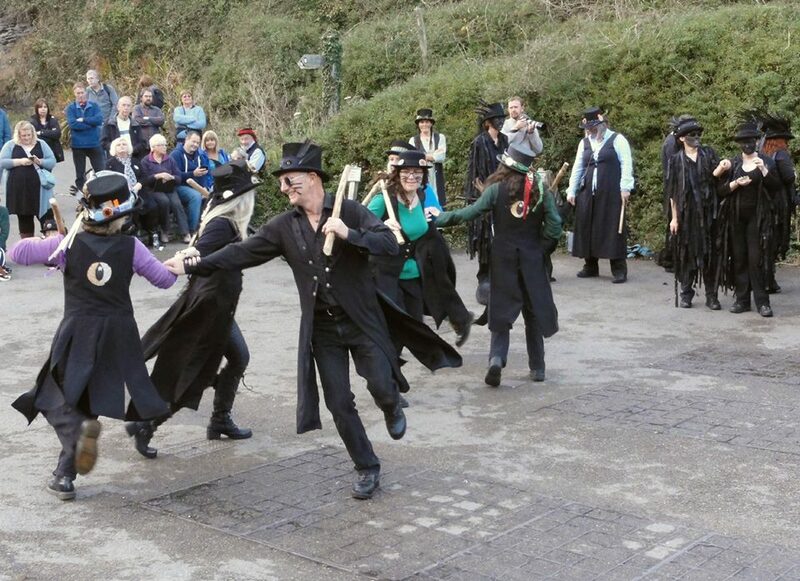 Fortunately, although we hadn’t arrived early enough to join in the opening dances from the many Morris sides that had attended, we had arrived just in time for the first Wassail. Then we spotted our first Mari and made our way slowly towards it. 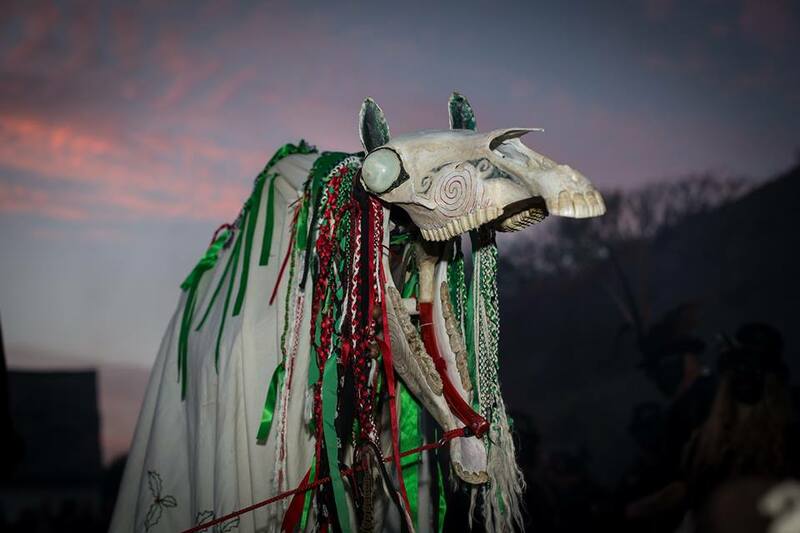 We had no preconceptions as to our welcome as we were very aware that the Mari Lwyd ceremonies were a custom that dated back hundreds of years, and we had no idea what reception our Cornish Oss would have. We needn’t have worried as our welcome couldn’t have been warmer! Penkevyll stood out because she is so dark whereas the Maris wear white and she attracted a lot of interest. I was in my element and so was Penkevyll, being surrounded by so many other Osses. The Welsh truly honour and show respect to their Maris often bowing to them. Many Maris were tethered and had handlers that were often women or children and they spoke to them lovingly. I dread to think what would happen if I tried to harness Penkevyll – we’d need one of those extendable leads as she’s forever running off and getting into mischief! One naughty thing that I noticed all the Maris including Penkevyll have in common, is their propensity to steal people’s hats! This was such a refreshing change as most of the time Penkevyll is often viewed askance by many and has actually had some folks acting very aggressive towards her. Having said that there are many who are very fond of her, especially when she’s being naughty (which happens often!) – nevertheless, she performs alone and has never met other pole Osses before. To see her move among the Mari Lwyds was very touching and I was in awe at the wonder and magic of it all. It was time to start the Wassail. A Wassail is a ceremony generally performed in an orchard or amongst apple trees. 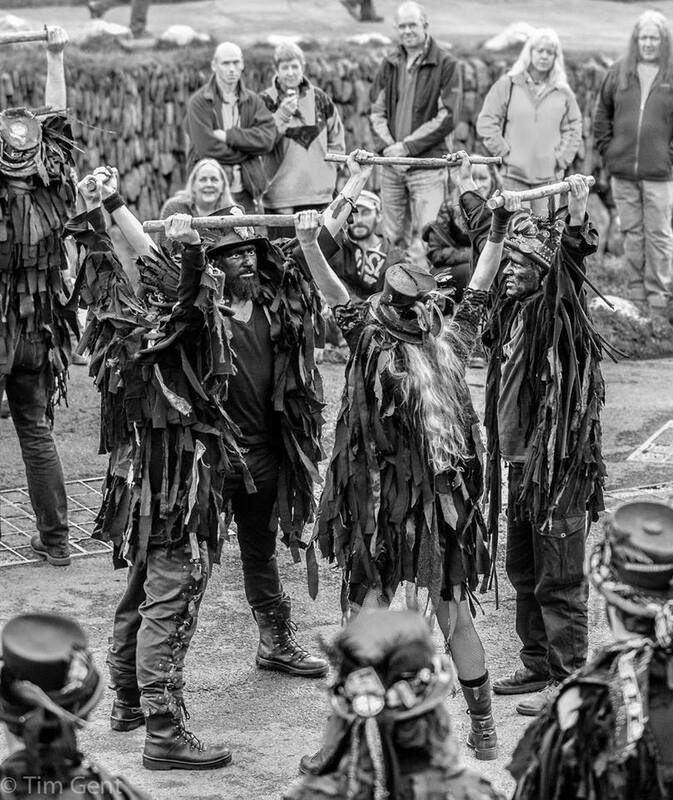 If you think of the Harvest Festival as a thank you for a good harvest, then the Wassail is a request for a good harvest for the coming year. Cider soaked toast is hung on the trees by women and a lot of noise, sometimes including gunfire is produced to supposedly drive away any bad spirits. 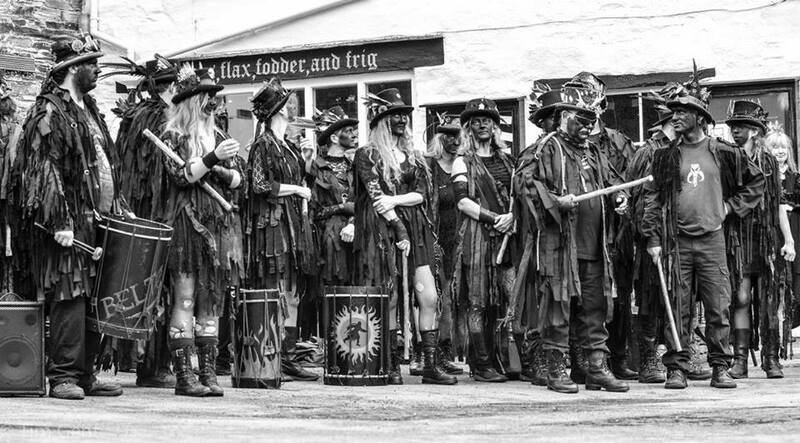 Following lots of singing and general merrymaking whilst circumambulating the cider fed trees we all made our way to the Three Tuns Inn where the first Mari ceremony would be performed. 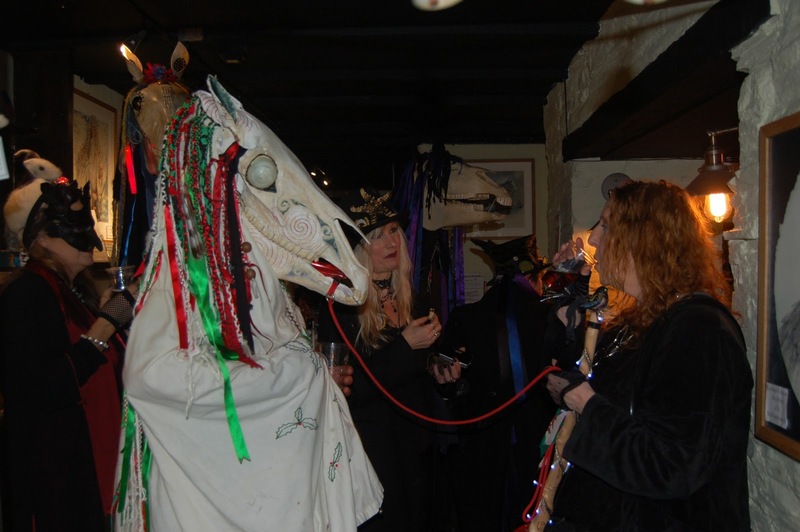 The Mari Lwyd ceremony is an ancient Welsh custom which originated in South Wales, similar to ‘first footing at New Year’. 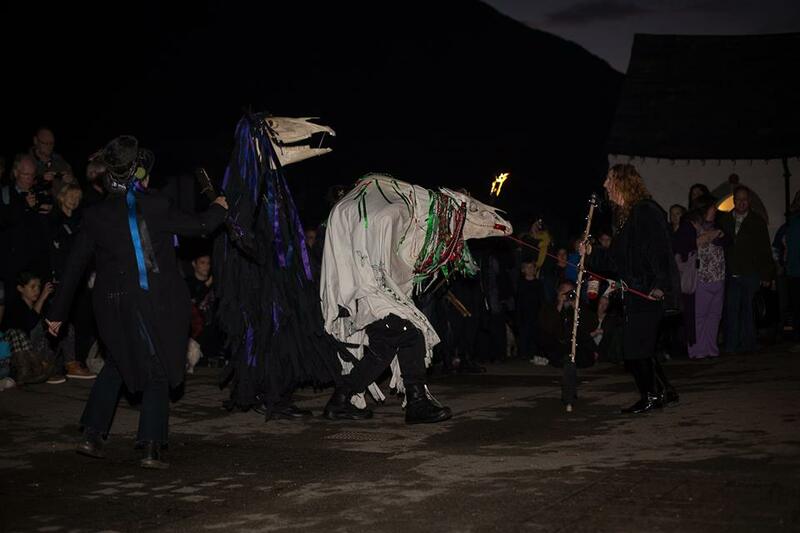 Traditionally a horse skull or representation of same is carried from house to house by the Mari Lwyd group. At the house a kind of singing competition (pwnco) between the group and the people of the house begins after the group has knocked on the door and requested entry for food and drink. 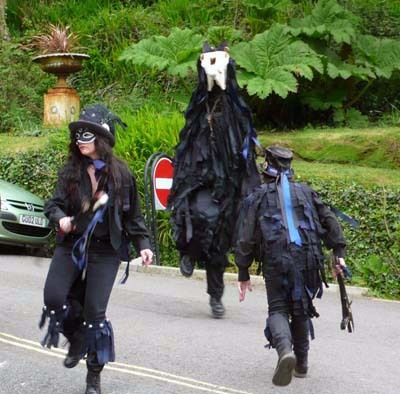 Eventually, the Mari group are given entry and sustenance, there is more singing and capers and then after blessing the household, off to the next house, pub or even museum. 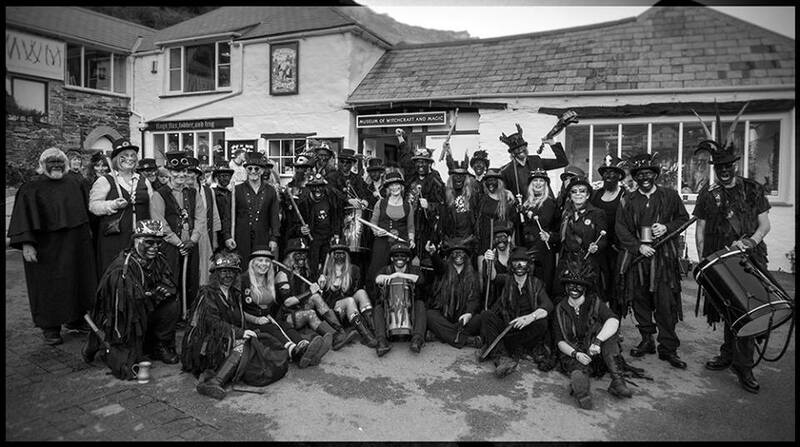 How we squeezed so many Osses and their handlers into an already full pub once we’d gained entry, I’ll never know! There was lots of singing and offering of ale to the Maris and it was at this time that everyone had also started to call Penkevyll a Mari too – we felt so honoured. The air was electric with energy and it all felt timeless and yet age-old at the same time…I felt truly between the worlds. We spent the next couple of hours eating, drinking and talking with some fascinating people, making new friends and creating important networking connections until it was time for the long-awaited Big Event. The Meeting of the Welsh and the English at the Border. This occurs on the old Iron Bridge which spans the River Wye and has been described as “It’s like going to War, and then all Peace breaks out!”. To our delight we were asked to march across the bridge with the Welsh rather than join the English on the other side. This was the time for us to get out our Cornish flag that we had brought with us which we proudly marched with to the sound of skirling pipes and drums. It was another moment when the hair stood up on the back of my neck as I watched all the Maris sway and dance to the rousing music. Our flag was exchanged and we now have a fine Welsh dragon flag. Our Cornish one remains in the Castle Inn until we return again. 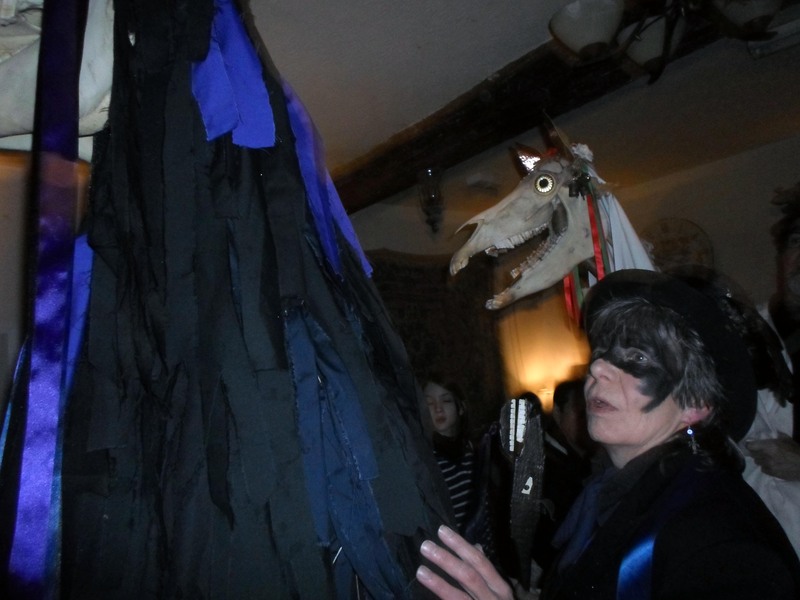 It was time to put Penkevyll back in her stable and pick up our musical instruments and join our newly made friends at the Castle Inn where we shared songs and tunes in an open mic/jam session which continued for the rest of the night. I learnt from that experience that there are very close connections with our Celtic cousins, the Welsh. 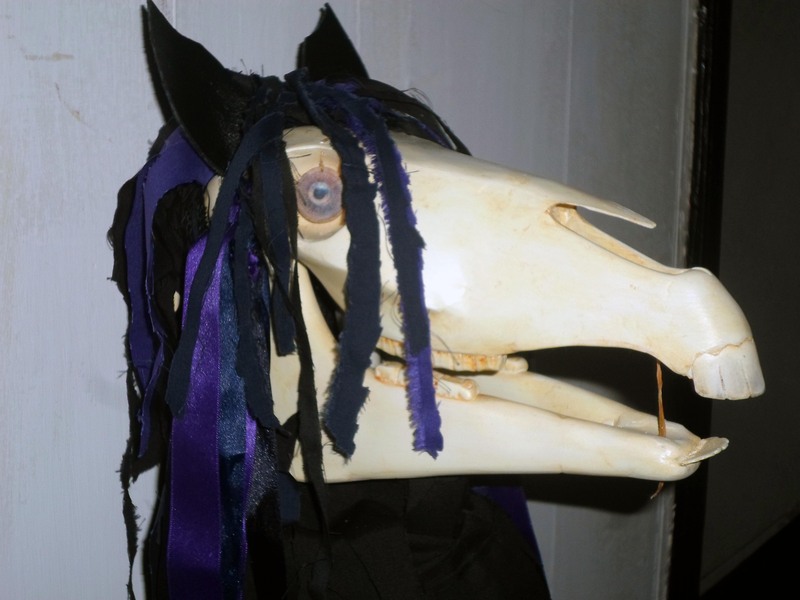 I had heard about the similarities with the language before but I must admit that I was still startled to realise that, Penkevyll easily translates from Cornish ‘Horse Head’ to the Welsh Penceffyl, and Cornish Boekka ‘Scarecrow’ to the Welsh Bwbach the pronunciations sounding almost identical. It’s going to take a while for me to assimilate all that happened at Chepstow – I’m still dreaming of Maris! 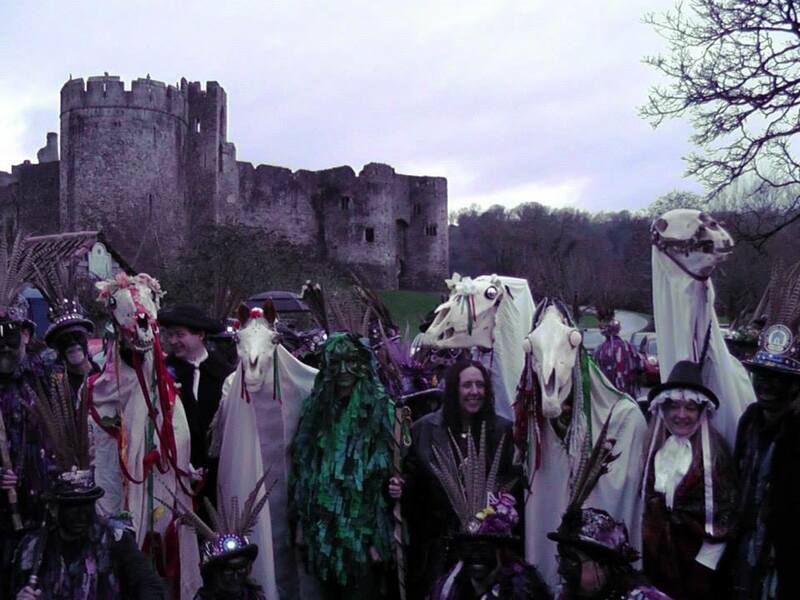 Many heartfelt congratulations go to all the organisers of the Chepstow Wassail with particular thanks to Mick Lewis who went out of his way to be so helpful. Bless you! All in all, a powerful festival that I would thoroughly recommend to you all, and definitely an experience I would love to repeat. 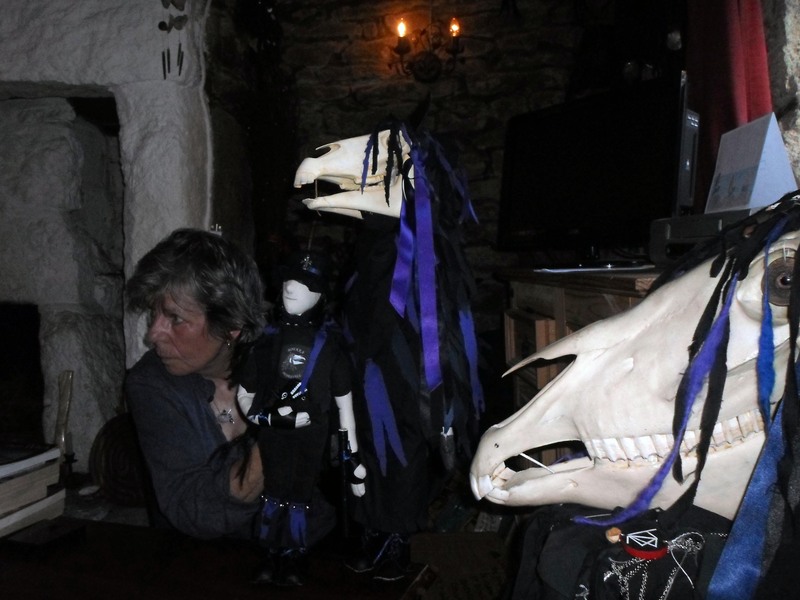 Here I am adding one of the most powerfully evocative songs I have ever come across concerning the Mari Lwyd. Music and performance by Chris Wood. Lyrics by Hugh Lupton. This is Boekka performing ‘As Above, So Below – drumming by Martin Ware. 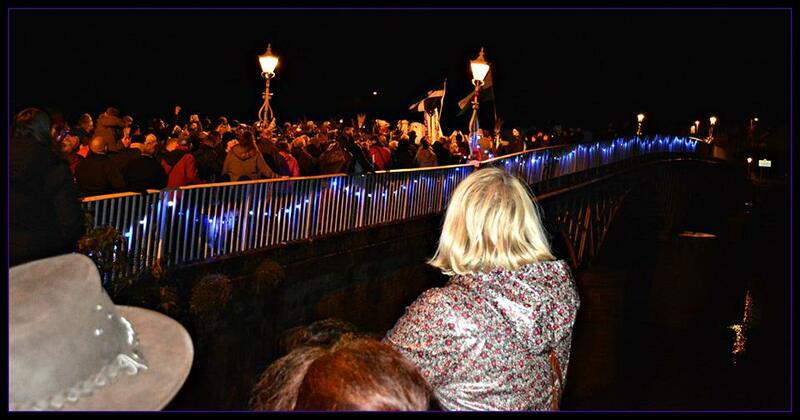 The Mari Lwyds meet the English on Chepstow Bridge. Footage on these three videos by Smikestock. Breaking News for the Dark Gathering!